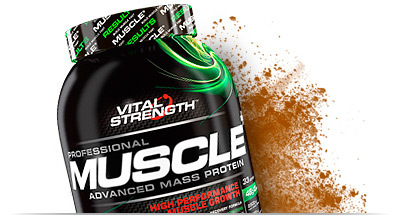 If you want best muscle gains you need the best mass gain formula. A genuine high protein mass gainer packed with superior quality protein sources, delivering muscle growth nutrients when you need them most. 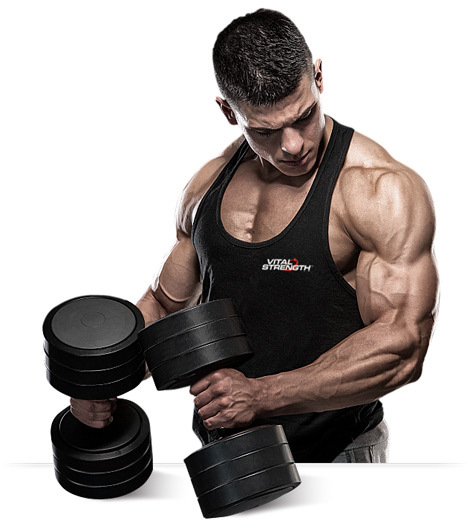 Gain mass and help prevent fat gain. Unlike any other, this powerful formula contains a specialised T4 Thermo-Burn complex designed to increase muscle size whilst minimising unwanted body fat. Increase strength faster with added cell-volumising creatine that delivers energy to muscle cells and promotes strength and muscle growths. 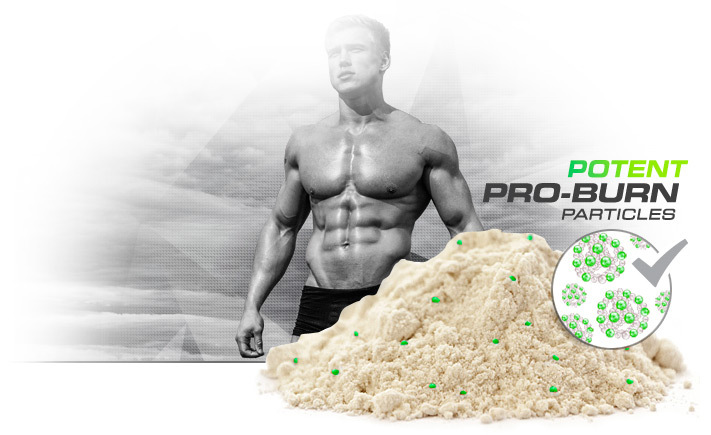 Engineered for the protein and energy needs of footballers, body builders, runners, endurance and strength athletes. 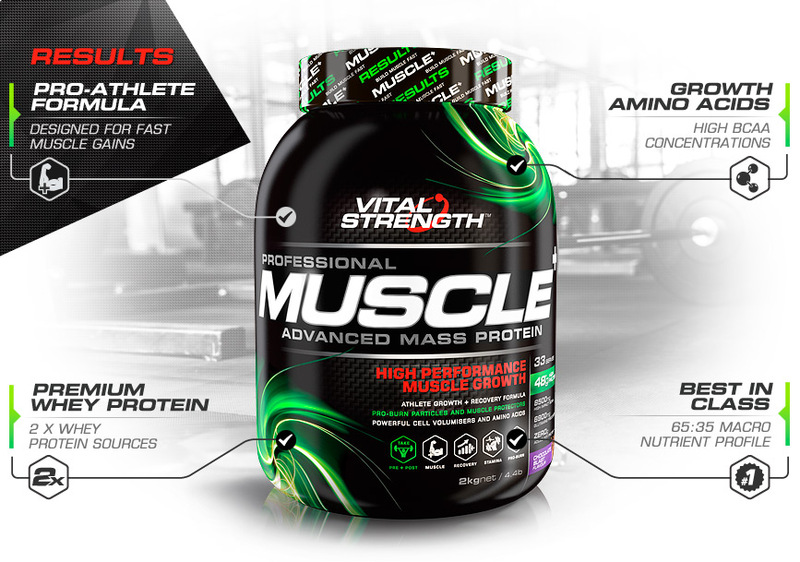 This high-protein, quality-carb formula aids muscle repair and growth when training demands are high..
Pro-Muscle features a multi-phase protein matrix of slow, medium and fast digesting proteins that feed your muscles with amino acids at varying rates. Packed with 8.5g of naturally occurring BCAAs, as well as glutamine pre-cursors that stimulate growth, provide muscle energy, boost recovery and help reduce muscle soreness. Contains no hidden nasties, delivering quality protein and carbohydrates in an ideal 65:35 mass gain ratio to rapidly replenish glycogen stores, reduce muscle breakdown and promote an anabolic growth state.. Available in mouth-watering Vanilla Ice-Cream, Chocolate Blast & Banana Split. Scientifically superior ingredients including anti-catabolic essential and BCAAs, plus scientifically-validated and cell-volumising creatine. Three high Biological Value (BV) proteins - whey protein isolate, whey protein concentrate and calcium caseinate - which deliver a wide range of amino acids to help promote muscle gains and anabolic nutrient delivery..
Fast-acting carbohydrate complex plus high dose amino acids, specifically designed to support athletes with increased energy and nutritional needs. Utilises multiple carbohydrate energy sources for fast/slow energy release and simple/complex nutrient absorption. Vitalstrength Protein Blend (65%) (Instantised Cross Flow Microfiltered (MF) and Ultrafiltered (UF) Whey Protein Isolate, Instantised Whey Protein Concentrate, Calcium Caseinate (contains concentrations of beta lactoglobulin, glycomacropeptide, alpha lactalbumin, immunoglobulin, bovine serum albumin), Maltodextrin, Dextrose Monohydrate, Fructose, T4 Thermo-Burn (L-Methionine, L-Carnitine, Choline, Chromium Picolinate, (Colour 102, 133)), Creatine Monohydrate, Guar Gum, Flavours, Sweetener (Sucralose). [Cocoa in Chocolate Blast flavour only. Colour (124) in Wild Strawberry flavour only]. Made in Australia from local & imported ingredients. Contains milk, soy products & traces of gluten (wheat based maltodextrin). Soy lecithin is used to instantise whey proteins and is less than 1% of the whey product. May contain traces of egg & cereals. This Protein powder is brilliant in every way. Mixes up so easily in a shaker unlike a lot of other products. Best tasting with water or with milk. Really gives your body the protein and nutrients it needs. Mix 60g (approx 3 scoops) with 400ml of cold milk or water. Best taken 60 minutes before and within 30 minutes of training. Serving size and frequency may be increased for athletes after consultation with a fitness or health care professional. 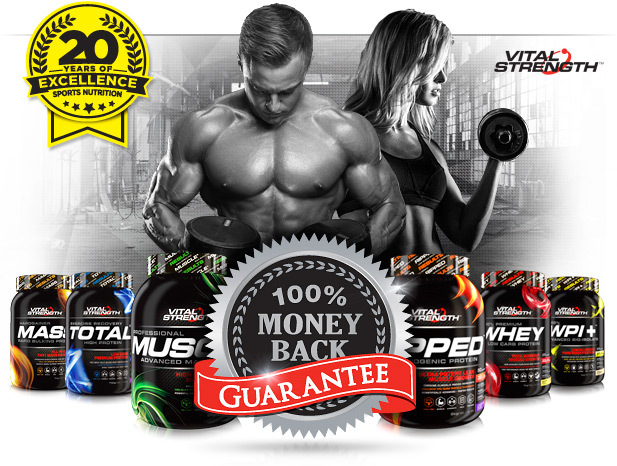 Vitalstrength Protein Blend (65%) (Instantised Cross Flow Microfiltered (MF) and Ultrafiltered (UF) Whey Protein Isolate, Instantised Whey Protein Concentrate, Calcium Caseinate (contains concentrations of beta lactoglobulin, glycomacropeptide, alpha lactalbumin, immunoglobulin, bovine serum albumin), Maltodextrin, Dextrose Monohydrate, Fructose, T4 Thermo-Burn (L-Methionine, L-Carnitine, Choline, Chromium Picolinate, (Colour 102, 133)), Creatine Monohydrate, Guar Gum, Flavours, Vitamins & Minerals (Calcium Carbonate, Magnesium Oxide, Ascorbic Acid (Vit C), Iron, Zinc Lactate, Vitamin E, Sodium Molybdate, Nicotinamide (Vit B3), Chromium Chloride, Potassium Iodide, Sodium Selenite, Manganese Sulfate, Folic Acid (Vit B9), Vitamin B12, Calcium Pantothenate (Vit B5), Riboflavin (Vit B2), Vitamin A, Pyridoxine HCL (Vit B6), Biotin, Thiamine (Vit B1), Vitamin D3), Sweetener (Sucralose). [Cocoa in Chocolate Blast flavour only. Colour (124) in Wild Strawberry flavour only]. Made in Australia from local & imported ingredients. Contains milk, soy products & traces of gluten (wheat based maltodextrin). Soy lecithin is used to instantise whey proteins and is less than 1% of the whey product. May contain traces of egg & cereals.